Summary of today’s show: Some of the mysteries of life can be better expressed in music than in words and God can speak to our hearts through that music. On May 6, Boston will host at Symphony Hall the world premiere of “The Suffering of the Innocents: A Symphony Homage and Prayer,” as a Christian work offered to the world. Scot Landry talks with Fr. Tony Medeiros and Antonio Enrique about the genesis of the work, the composer behind it, and how Cardinal Seán worked to bring it to Boston. 1st segment: Scot welcomed everyone to the show. He said today’s show is about a unique event on May 6 in Symphony Hall in Boston, a symphony composed by Kiko Arguello called “The suffering of the Innocents”. There will be about 200 musicians from Europe and America in the orchestra. It will be one of three public performances of the symphony in the US. Kiko Arguello is one of the founders of the NeoCatechumenal Way. Scot welcomed Fr. 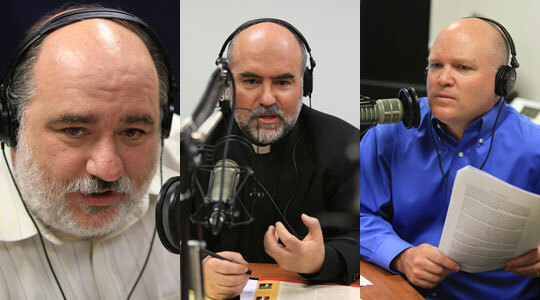 Tony Medeiros, rector of Redemptoris Mater Seminary in Boston, and Antonio Enrique, editor of the Pilot, to the show. Scot asked Fr. Tony how the symphony came about. Fr. Tony said the experience of suffering is something Kiko has wrestled with since he was a young person, understanding the suffering of people, whether it’s from their own actions or due to no fault of their own. Scot said you can sometimes see the cause of suffering, but so much of the suffering in the world seems unfair. The mystery of suffering and why God permits it is one of the big questions. This symphony seems to be a response to why God allows innocent people to suffering. Antonio said this is the focus of the symphony. The paradigm of suffering is the crucifixion of Jesus Christ and the symphony addresses it from the perspective of Mary, who suffered in her own flesh next to the cross. Through her, our sufferings can make sense in the Cross of Christ. Scot asked Fr. Tony about Kiko’s background, who seems to be a renaissance man. He’s one of the best known artists and architects in Spain. Fr. Tony said Kijko was a disciple of Pablo Picasso as a young man and his early work was influenced by Cubism. At the age of 19 he won a national prize for fine arts in Spain. Then in no small measure due to suffering of people, who began to confront the purpose of his life. This happened in the years around the Second Vatican Council. Enlightened by words of Pope John XXIII calling for renewal of the Church through the poor, and inspired by the spirituality of Bl. Charles de Foucauld, who wanted to influence the world through adoration of the Eucharist. Kiko leaves his family, feeling called by God to live among the poor in the outskirts of Madrid for three years. This is where he developed the blueprint for the Neo-Catechumenal Way, in the questions of the people he lived among and which he tried to answer. Scot asked Antonio what it is about the experience f the poor that provides answers to the larger questions of life. Antonio said we are used to living in a way that presents a particular face to others, hiding our real feelings and thoughts. But the people in the shantytowns live in a different way. In that environment, the reality of the Gospel could be announced in a different way. The Gospel tells us that prostitutes will precede us in heaven, which helps them know that God loves them despite their sins. Without the buffer of polite society, you are able to enter into the reality of their lives more readily. The people Kiko encountered started to change. Thieves stopped stealing. Parents sent their children to school. So much else changed. Scot asked about Kiko’s musical background. Fr. Tony said some of Kiko’s songs are popularly known and sung around the world. He’s put music to most of the Psalms and some of the Scriptures. But before now, Kiko has never written a symphony. He’s never studied it or written it. But last year, Cardinal Ruoco of Madrid asked him to prepare music to inspire youth coming to World Youth Day in Madrid. So he brought together many musicians and from that came the seed of the symphony, along with the seed from his time in the shantytown. Giving expression to suffering isn’t easy. Fr. Tony said we are compartmentalized in our own lives about our sufferings. We carry wounds in us that we try to hide. Sometimes we don’t know how to express it. This music is a way of expressing it. The way the symphony was written is that Kiko would hum a tune and the musicians would adapt it for their instruments and play it together. He says now that he’s not a real composer like Mozart or Beethoven, but he said a priest told him never to not do something for fear of being criticized of being vain or prideful. Antonio said the first time a part of this symphony was played was before the Holy Father. After that, they went to Israel to perform at Domus Galilee before 250 bishops from around the world in January 2011. Cardinal Seán was there among 7 or 8 cardinals. Antonio said some rabbis happened to be present at the same time of the performance as well as some Israeli politicians. Then after the symphony, it resonated in them in ways that were very deep. They were very impressed and one of the rabbis, Rabbi David Rosen, gave a beautiful address to those gathered on how the symphony resonated with the suffering of the Jewish people. Through the music, they felt loved by this work. Taking into account historical Christian-Jewish relations before the Second Vatican Council in which some of the teachings of the Church were used to persecute Jews, they saw this work now as an expression of love. Fr. Tony said Rabbi Rosen’s remarks were not planned, but were a spontaneous response to the symphony. Scot said it doesn’t seem the Kiko narrowly defined the category of innocents, but used a broad definition that would include the Jews who died in the Holocaust. Fr. Tony said there a memoir of an SS guard at Auschwitz who witnessed thousands of Jews dying in gas chambers. He eventually heard a voice inside him telling him to help them. The voice told him he could help by removing his clothe and getting in the line with those going to their death. He wasn’t a Christian, but a pagan, and sought an explanation for this voice inside him. But Jesus really was the one who got in line with those lined up for the gas chamber to defeat death from inside itself. He is a pill of immortality that explodes from within through death to eternal life. Fr. Tony said for many this will be their first time in Symphony Hall and many may not even understand what Kiko will say, but in their hearts they will have a dialogue with the Holy Spirit. Scot said one of the reasons the event is almost sold out is because Kiko asked that it be offered free of charge. Antonio said Kiko felt the message being announced of a meaning for suffering is something that you can’t pay for. There is not enough money to pay for such a message. Especially in Boston, the focus is geared toward Catholics. Cardinal Seán felt strongly about having the symphony here. He asked every parish to receive free tickets so that the pastors can bring a handful of parishioners. Close to 90 parishes have responded so far. Antonio said in New York it will have a wider audience. Rabbi Rosen had asked it to be brought to New York in order for the Jewish community there to experience it. They have made an outreach to Jews of all the different Jewish groups to come and experience it. It’s given as a gift to our Jewish brothers and sisters. On May 14, the symphony will take place in Chicago. 2nd segment: Coming back from break, we heard a selection from the symphony. Scot can’t recall ever hearing about a gathering of 3,000 Catholics in Symphony Hall to hear a composition by a Catholic composer. He asked what Cardinal Seán’s involvement will be. Fr. Tony said Cardinal Seán will preside at the gathering in light of his experience in hearing it for the first time in Israel. Originally the symphony wasn’t coming to Boston, just New York, but the Cardinal asked for it come here. The Cardinal sees a means in a very sensitive way to introduce a way to articulate the pain we carry within us. The music is a means for people to find a vehicle of expression to see that God has not forgotten them,. but is with them always, looking for an opportunity to show us his grace. Fr. Tony said most oft he most beautiful music we hear in symphonies is inspired by Christ and Christian faith: Bach, Mozart, Beethoven. What inspires us is the mystery of Christ who becomes flesh, dies and rises as the first fruit of a new creation. I have kinship to Jesus Christ through music and word and sacrament. Scot said there are four parts of the evening: A greeting and prayer; introduction by Kiko, five movements of the symphony, and remarks by Cardinal Seán. Scot said there are 194 musicians and 90 voices in the choir. They discussed some of the more obscure instruments that will be in the performance. Scot asked how this is getting paid for if the tickets are free. Fr. Tony said they don’t know, but if it comes from God then they have faith it will be paid for. They followed the signs laid out before them. Maybe some benefactor will make a contribution, but they are convinced that God wants this to be done for the love of the people. To reserve one of the remaining tickets, email infoboston@sufferingoftheinnocents.com or call 617-879-9814. If the tickets run out, your name will be put on a waiting list. Scot said Rabbi David Rosen is being honored by Redemptoris Mater Seminary on June 24 at at their gala dinner at the Four Points by Sheraton in Norwood. He said they’d invited Rabbi Rosen before the concert was coming to Boston. Scot said the honoree at last year’s dinner was the late-Archbishop Pietro Sambi, who was apostolic nuncio to the United States. Tickets for the dinner can be had by calling 617-879-8914 or email seminary@rmsboston.org.